Carnival Vista is docked at Port Miami here in all its glory. Another stunning video by Miami Drone Flights shows the ship just before departing on another Caribbean cruise. 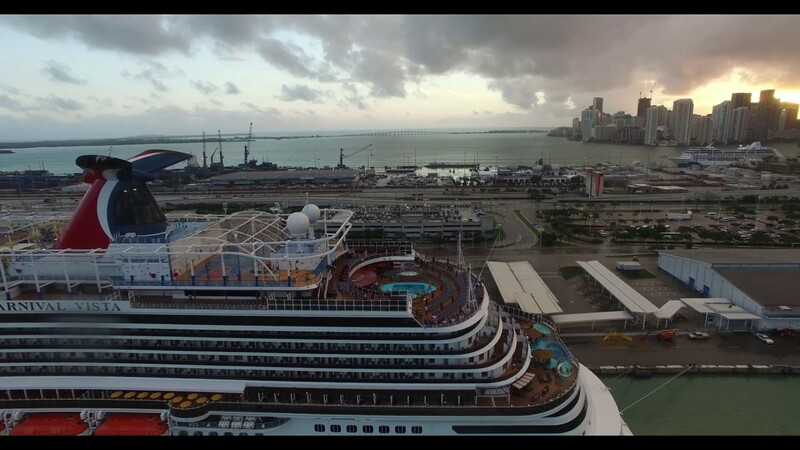 The drone footage was captured earlier in the year and during the evening just as all the cruise ships were departing Port Miami. Still remaining and waiting to depart was the Carnival Vista, Aidavita and the Disney Magic, all departing on Caribbean itineraries. Carnival Vista set sail on a 5-night cruise including calls in Amber Cove and Grand Turk and then back again for another sailing. Carnival Vista is a 133,500 gross ton vessel which entered service for Carnival Cruise Line this year. The ship began sailing out of Miami year-round in November 2016 and made its first United States debut in New York after spending an inaugural season in the Mediterranean.